Update: One of the photos in the tutorial was incorrect and has since been replaced (July 4th, 3:20p.m. EDT). If you downloaded an earlier version of the tutorial, you may want to download the file again. 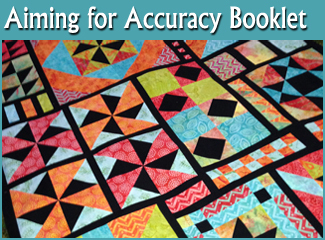 Welcome everyone to the second lesson for the Aiming for Accuracy Quilt-Along (A4AQAL). If you’re new here, please be sure to check out the main QAL page where you’ll find all the information you need including the fabric requirements, colour charts, recommended products, getting started information, cutting instructions for your background/contrast fabric and the first block. We have weekly prizes that everyone can enter. Amy Gay of Butterfly Angels Quilting has volunteered to be Prize Coordinator and will be communicating with the winners and sponsors. For the first 12 weekly lessons, we have five or six prizes to give-away each week. To enter the weekly give-aways: Each Saturday, there will be a blog post available on the Quilting Gallery site, where you will upload your completed photo for that week’s lesson. Check the main QAL page for the link. You’ll have until the following Friday evening to enter. Amy will be choosing the week’s winners on Saturday morning. For those that have completed Lesson 1, submit your photos here. For this week’s lesson, I wanted to touch a little more on fabric ease. As I mentioned in the earlier Improving Quilting Accuracy blog post, easing is taking advantage of your sewing machine’s feed dogs to ease, or blend, two pieces of fabric so that they are the same length when sewn. You do this by placing the fabric that is longer on the bottom and using a tonne of pins to attach the fabric on the top. When attaching the sashing strips for our units, I prefer to sew with the sashing strip on top. I have more confidence that my sashing strip has been cut more accurate than the fabric block I’ve stitched together. Your experience may not be the same, so adjust if needed. To attach the sashing strip, or as we move along to other lessons, other units together, the first thing I do is fold the unit in half to find the exact centre, finger press a crease at the edge or drawn a line so it’s easy to see. I’ll do the same with the sashing strip, i.e. find the true centre by folding in half. Then, I’ll add a pins at the centre and both sides, making sure to align the sashing and block unit at the sides so that it is square. Then, I’ll add pins half-way between the centre and sides, essentially quartering the unit. If it’s a really long piece, or one that needs a lot of help easing together, I might fold the sides to the centre and mark the exact quarter of both the block and sashing piece. Finally, I’ll continue to add as many pins as are needed before stitching the unit together. Thank you for the great tutorial. Hope to make the block tonight. I am going to do it soon.